There are a surprising number of plants poisonous to dogs that are grown as houseplants. Dogs, especially puppies, love to chew on things - bones, shoes, couch legs, and those things they see you paying attention to. Which includes your houseplants. 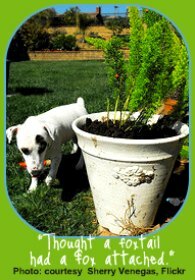 The Indoor Gardener who raises a dog as well as greenery needs to know which plants to buy and what to do if his/her canine gets hold of the wrong leaf. Although most toxic houseplants aren't lethal, the following symptoms can occur if Fido ingests the leaves, stems, bark, berries, flowers, or roots. Most toxic plants cause temporary symptoms, but call your vet immediately if you think your dog has swallowed a toxic plant. You should also have your local poison control centers number on hand (and tested). Note that the list is similar to but not the same as that of plants poisonous to cats. For a more complete list of plants poisonous to dogs, visit the ASPCA website for lists of outdoor and indoor plants poisonous to dogs, cats, and even horses, as well as lists of plants that are safe to grow around your pets. If you can't find the plant you're interested in growing on the lists, the Cornell University Department of Animal Science offers a database organized by both common and scientific plant names. Never, ever grow a Sago Palm, or Cycad, when you have pets around. All parts of the plant are poisonous to dogs and cats (and humans). It's one of the oldest plants on Earth, and it seems to have survived this long by keeping everything else away from it. Remember also that the Indoor Gardener needs to be aware of more than just plants poisonous to dogs. Plant care products can be trouble, too. Prepared soil, soil additives (including bone meal, lime, sand), insecticide, fertilizer, and plant food can also cause reactions in your pet. An Indoor Gardener with a dog should buy Organic or Non-Toxic products to care for both their houseplants and their pets. 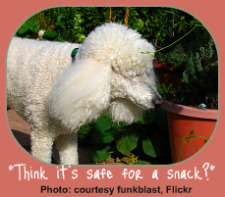 Occasionally Fido will have an individual allergic reaction to a plant that isn't on a list. If you notice symptoms, respond immediately. Call your vet or the ASPCA hotline at 1-888-426-4435 in the U.S. (the fee is presently $65 for this service). One of my favorite breeds of dog is the Golden Retriever. Check out information about raising this great pet the right way! If you're an owner or thinking of becoming an owner of the dimunitive Chihuahua, take a look at these pages about sharing your life with this compact breed. for a list of what you can grow. so everyone stays happy and healthy in your home. guarantee. Please check with your vet for any further questions. Indoor-Gardener.com cannot be held liable in any way for information about pets and houseplants as presented on the website.